âWhat makes The Sun work for me is the massing of color. If you take a thousand hand-blown pieces of a color, put them together and then shoot light through them, it's going to be something to look at.' Dale Chihuly A new public sculpture for London will be unveiled by Dale Chihuly on April 3rd in Mayfair's Berkeley Square. The 14 foot installation consists of more than 1,300 hand-blown glass elements, weighs 4,230 lbs. 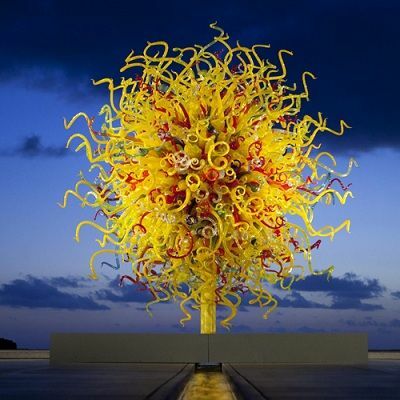 and will be installed over four days by members of Team Chihuly. The radiant globe of colour will be illuminated each night. The Sun has been on view in many prestigious museums and gardens around the world including the New York Botanical Garden (2006), de Young Museum (2008), the Salk Institute for Biological Studies (2010) and the Montreal Museum of Fine Art (2013). His outdoor sculptures engage individuals and communities and help to promote dialogue. Chihuly enjoys the fact his works are easily accessible, placing them in the front gardens of our urban realm and inviting people to respond. Dale Chihuly's current exhibition âBeyond the Object' at Halcyon Gallery, 144-146 New Bond Street has now been extended until 21 April due to overwhelming public demand. More than 20,000 people have visited the exhibition since it's opening on 8th February.